Keep an eye out for the resident Walrus, and, if you see The Prius, will you, please! send me a personal message? You forgot about the Yeti that sits a top Aasgard waiting to eat people as they top the pass! Snowpack was way better in the spring of 2017. My estimate is that we are a month to a month and a half ahead of 2017. I skied Granite to the base of the avy path in late April that year. This year it's been out for a couple weeks already. Thanks again for all of the info. I love my hammock but may have to settle for a tent if I can't find enough reasonable spots to camp. 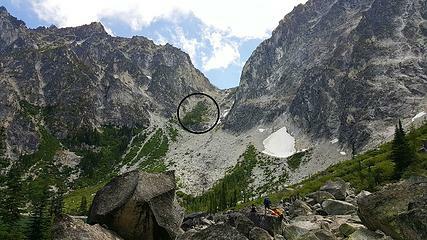 When I had a Colchuck pass someone suggested hammock camping part way up Aasgard in the trees shown. (thanks whomever I stole the photo from) Is this reasonable? Then we would be closer to the core to start day 2. Maybe you've already moved on from this idea. I would say a major drawback from using this site is distance from a water source. I don't think even the creek that drains down that slope would be particularly accessible from there. I think water would be fairly accessible. Here's an image that shows the area better. Be aware of dangerous waterfall holes. The concern I might have is whether the area is within the Colchuck zone. The permit area map shows the border at ~6400' which is right on the edge of the outcropping. The OP mentioned they were awarded a permit for the Core Zone. The "golden" permit, Core zone, still allows the holder to camp in any of the 5 permit zones. So although you are expected to be in the Core zone since it is so desirable, they could camp in the Colchuck zone instead. If it were me, I'd push on to the Core zone and set up camp there. "Reminder: A Core Enchantment Zone Permit allows you to camp in ANY of the 5 permit zones"
Following along, I have a core permit for July 11. I'd push on to the Core zone and set up camp there. Always push on to the Zone!!!! The Zone demands respect!!! JPH, sounds like the snow is melting pretty quickly. I am sorry for the skiers but I hope it continues for our sake. How do you keep updated on the conditions? I would love to be able to follow this and be prepared. My first time through, I saw a woman and her father using a cane make it through in one day. They took a lot of breaks. Best time I ever did was 55 minute up and 30 minutes down. I was only carrying 17 lbs for three days. LOL. You gain elevation REALLY fast on the way up.